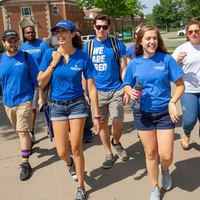 Campus walking tours for prospective and incoming students give our guests a look into the life of Fredonia students. Tours are led by current students who share their stories while presenting an overview of the university. If you are interested in exploring a specific major we encourage you to reach out to the academic area to meet with a professor either before or after your tour. Each campus tour is preceded by a half-hour presentation from one of our admission counselors, covering undergraduate admission and financial aid at Fredonia.